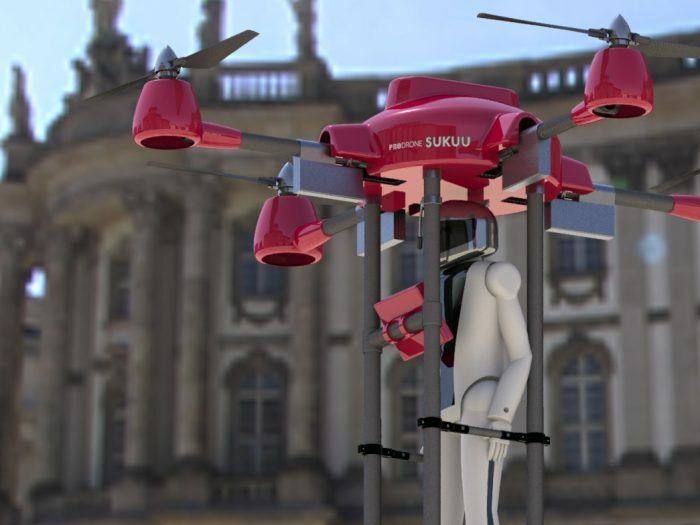 Prodrone Co., Ltd. announces that it has developed a new Interactive Search and Rescue Passenger Drone called SUKUU. The drone is exhibited in Japan Drone 2019, which is an International Expo for Commercial UAS Market held in Makuhari Messe, Chiba from March 13th through March 15th. SUKUU is capable of flying for 15 minutes with one passenger (max weight 100kg). The aircraft is foldable so that it can be carried in a car. It will not be operated automatically but will be controlled by a specially trained pilot who can control the drone at a safe place such as in a car or a rescue headquarter through FPV and carry out the rescue missions. A specialized pilot will communicate with a rescue through a speaker, a camera and a microphone mounted on the drone and will give instructions and comments to sooth him/her anxiety. More detailed information about the product will be available once we decided the detailed specifications.